With the release of the 3D remake of The Legend of Zelda: Majora’s Mask on the horizon, I’ve been reminded of another game from the Nintendo 64 that was redone on the Nintendo 3DS. And no, I’m not talking about Ocarina of Time 3D. I’m talking about Star Fox 64 3D. Star Fox 64 was one of the best games on the Nintendo 64. It had fast-paced gameplay, great graphics for its time, and used real tie-in dialogue to great effect. I played it over and over again for years to try and get all the medals, and would gladly do it all over again. And now I can, thanks to the remake on the 3DS! 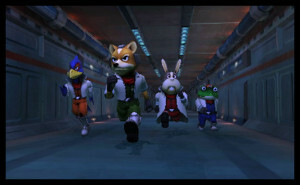 Disappointingly, however, Star Fox 64 3D was released to very little fanfare. It just sort of showed up on store shelves, and didn’t seem to get the attention it deserved. This could be attributed to it being released in 2011, which was the same year the 3DS came out. People were hesitant to adopt the system with its high price tag and possibly eye-damaging 3D gimmick, so most early games probably didn’t fair much better. Regardless of the reasons, it’s high time it was given a fair shake. The first thing to address is, of course, the new visuals. The graphics look amazing, and are leaps and bounds ahead of the 64, which is amazing considering it’s on a cart that’s a fraction of the original’s size. Everything from the textures to the lighting and effects are handled with a level of care that only Nintendo could provide. It runs buttery smooth too, with no frame rate issues whatsoever, even during big dogfights. Sound design is a mixed bag. The remixed music sounds great and maintains the original’s tone while also improving on it. The voice acting, unfortunately, feels a bit stilted. The original voice work, while certainly corny, was charming and fun. This time around it feels like they were trying too hard to capture the original’s flair. It falls flat. The gameplay is simultaneously good and bad. The levels, sans the visuals, are exactly as they were in the original game, making it super easy to jump right in. This is good. You can also choose between an easy mode of sorts and the classic N64 difficulty, which is also good. Easy mode, however, exists because of the option to use gyro controls in the game, which just terrible. Gyro controls use the accelerometer in the 3DS to steer your ship, which is horribly awkward, slow, and completely unplayable if you have the 3D on. Thankfully it’s entirely optional, and you can choose between a newer control scheme and the more classic N64ish layout. Playing Star Fox 64 on the 3DS can feel a little awkward at times. Such a fast-paced game with a lot of button mashing can start to wear on the hands with such a small button layout, and since the screen is connected to the controls, it pretty much guarantees that you’ll never find that 3D sweet spot. If you’re foolish enough to try the gyro controls you might as well turn the 3D off entirely. This complaint might actually be rectified with the release of the New 3DS, since it has facial tracking for better 3D viewing. Speaking of which, the 3D in Star Fox 64 3D, when you’re not fighting the screen for the sweet spot, looks great. Vehicles and other objects pop out at you during cut scenes, and the added depth really helps to judge distance while playing. Despite all the issues associated with it, it’s best to play with the slider as high up as possible. 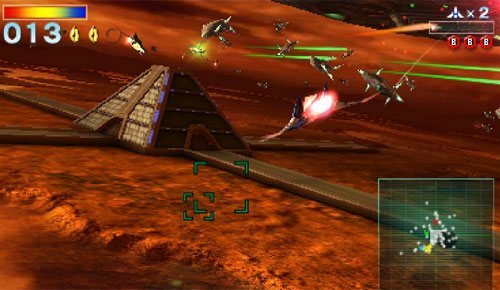 The multiplayer in Star Fox 64 was simple, fun, frantic four-player mayhem. Sadly the 3DS version lacks some of the appeal. It’s great that it offers four players with only one copy of the game, but it’s not always easy to get that many people who own a 3DS together in the same room. The biggest disappointment is that all the game modes are strictly air combat, with no way to play on foot or with the Landmaster Tank like in the original. Frankly, Star Fox 64 is primarily a single-player experience, so it’s no big loss. 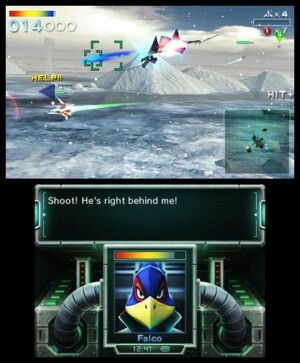 Star Fox 64 3D does a lot right when it comes to remaking a game. It plays like the original, while adding many improvements. Despite the flat voice acting and gimmicky control options, it could be called the definitive version. At the very least it’s my go-to when I want interstellar dogfighting action, but then again I don’t have my N64 hooked up. It’s not perfect, but it is a great remake and should not be overlooked. Star Fox 64 3D was developed and published by Nintendo, exclusively for the Nintendo 3DS. A copy of the game was independently acquired by the reviewer.